LEONARDO DiCAPRIO as Cobb in Warner Bros. Pictures’ and Legendary Pictures’ sci-fi action film “INCEPTION,” a Warner Bros. Pictures release. Leonardo DiCaprio's two and half hour dream-thriller stayed number one at the box office this weekend. 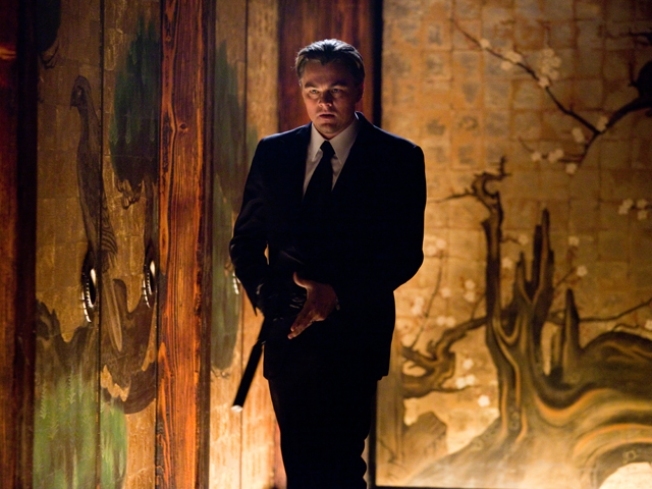 'Inception' hauled in $43.5 million, brining its 10-day earnings up to $143.7 million, the AP reported. The spy story 'Salt,' which launched this weekend, did brisk business but could not catch Chris Nolan's flick. Angelina Jolie's action/adventure about a CIA agent going rogue took a respectable $36.5 million. In the third spot was Steve Carrel's animated comedy, 'Despicable Me.' Since its release, the family hit has earned $161.7 million. Unusual for summer movies, these top three films were all original ideas, and not adapations of existing stories or franchises. "Typically in summer, all we're seeing are rehashes and sequels and reboots, whatever you want to call them," said Paul Dergarabedian, box-office analyst for Hollywood.com. "To have original stories as the top-three films is a lesson to studios that maybe audiences are open to more originality in the summer," Dergarabedian said, "and to perhaps not play it so safe, even though that goes against the grain of every fiber in every studio executive's being."